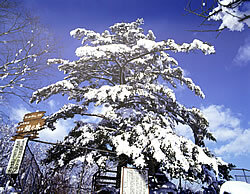 This large fir tree still remains at the Funaokajyo Park. As a living witness of the times, when unraveling the secret that the tree conceals, the old history of Shibata-machi, many facts and fates from the Date Disturbance are recalled vividly. About 340 years ago (3rd year of Mangi period, 1660) the 3rd clan leader with its official income rating at 625,000 koku, Date Tsunamune was ordered by the shogunate to retire due to misconduct, and the 3 year old Kamechiyo succeeded as the head of the family, which later caused the Date Disturbance or the Date Sodo. "Momi no ki wa nokotta (The Fir Tree Remains)" was a historical drama based on that Date Disturbance by Shūgorō Yamamoto (aired in 1970). The Kai Harada character was turned from a rebellious subject to a loyal subject who kept the peace and security of the Date Clan by preventing Tadakiyo Sakai from crushing the Sendai Clan using Date Munekatsu, the son of Date Masamue. This new opinion has attracted the attention as a new version of Kai Harada, as it overturned the established theory of the past. In the 11th year of Kanbun after the related interrogation work at the house of Sakai was held, it became a bloody riot, with Kai cut down, the males of the clan committing seppuku, the women being under custody, and many of the vassals becoming farmers - ultimately leading to a sorrowful fate. When the drama was aired on TV, many people who wanted to glimpse the fir tree came to visit Shibata-machi. 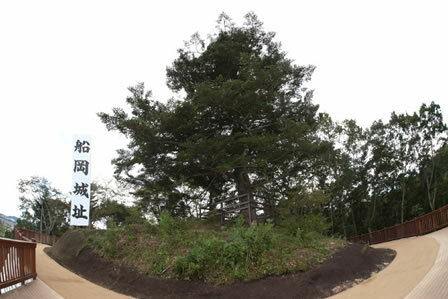 In October 2011, the area surrounding the fir tree was reorganized and a "Momi no ki wa nokotta" observation deck was constructed, allowing the view of Shiroishigawa banks. During the cheery blossom season, the 1000 cherry trees can be viewed from here.